Four years ago, frustrated after having a bad experience with an Armalite AR-180B, I purchased a Colt 6920 rifle from a gun store in Northwest Louisiana, which I was passing through at the time. Since then, I have put close to five thousand rounds of steel-cased ammunition through the rifle, along with about a thousand rounds of brass-cased ammunition. During the past four years, I have tried numerous times to get the rifle to stop working, and only succeeded once. Along the way, I used the rifle to shoot at targets that conventional wisdom says are too far away to hit with a 5.56mm carbine. This review will cover my experiences with the rifle in greater depth, and conclude with why I think the Colt 6920 is a benchmark for civilian self-loading carbines. Despite my best efforts to push the rifle beyond its limits, I found the Colt to be as reliable as the Yugoslavian M70B1 AK that I owned at the same time. Shooting through Southeast Texas rain and mud, New Mexico sandstorms, and thousands of rounds without cleaning, the rifle proved itself to me as an outstandingly reliable machine. In one of my attempts to make the rifle fail, I picked the most pitiful looking USGI magazine out of about twenty that a friend had brought back with him from his deployment in Iraq. This magazine had broken most of its welds along its spine, and had been crudely re-welded. The sides of the magazine were not quite parallel; the “box” cross-section of the magazine being more of a trapezoid than a rectangle. Despite this, the rifle – which at this point had not been cleaned in over a thousand rounds – worked flawlessly, for over 120 rounds fed from that same magazine. Even so, the only malfunction I ever experienced with the Colt happened while shooting over three hundred rounds through a New Mexico sandstorm. Towards the end of shooting, the bolt failed to lock back on an empty 20-round Pmag. A quick spray of oil through the ejection port with the bolt closed fixed the problem, and I experienced no further issues with the functioning of the rifle. Throughout the time that I have used the rifle, I have greased the bolt carrier with TW-25b aviation grease. In the summer of 2010, I bought one tube; which is still almost full, as the rifle needs lubrication very infrequently in my experience (I’d say once every thousand rounds or so, depending on the conditions). 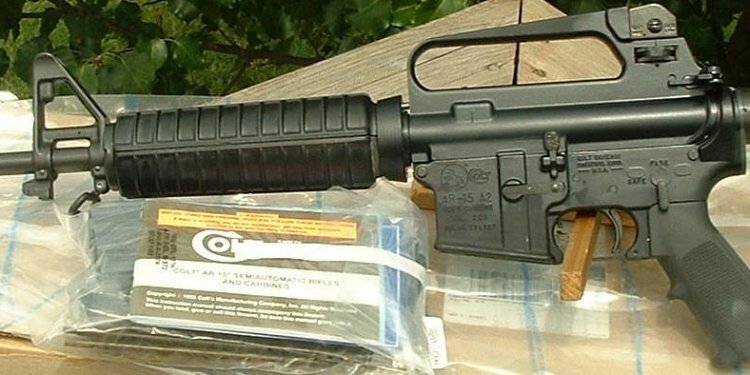 While probably a more high-end product than the average user will ever need – I have seen AR-15s run perfectly through several hundred rounds in a session, lubricated with old motor oil – this product is relatively inexpensive for how long it lasts when used in moderation. A simple run over the contact surfaces with a lathered cotton swab is enough in my experience to keep the gun running for well over a thousand rounds. My only major mechanical concern with the rifle involved the barrel nut tension. As part of a gunsmithing course, I once had to completely strip the rifle down to its pins, and to do this I had to remove the barrel. However, the torque on the barrel nut was so great that myself and my instructor were only able to remove it using a cheater bar, a technique that destroyed the teeth on the nut itself. Once the replacement delta ring assembly came in, I torqued it down to about 50 pound-feet. This issue was mostly likely unique to my rifle, and certainly didn’t affect it in any way outside of being able to take it apart easily.